As children, we all enjoyed playing games with elements of competition. Was it a fantasy warfare play, a spy or cowboy, and Indians games, every one of us could recall the experience of playing them at least once in our childhood. As we enter adult lives, the spirit of competition transitions into more grown-up activities, however, we all experience the inner child evoking in us time after time. 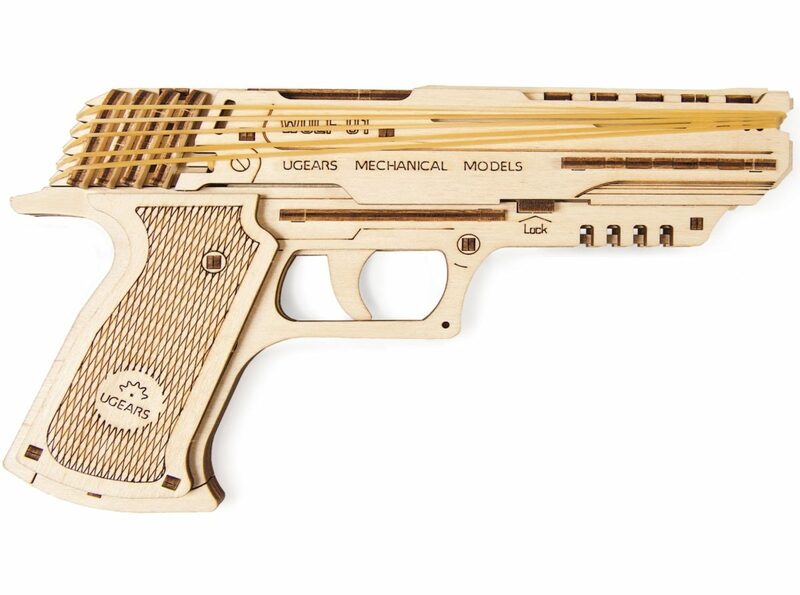 Today, UGEARS offers its new revolutionary wooden toy handgun model – the Wolf-01. The Wolf-01 is a full size, authentic reproduction of a classic pistol that features traditional UGEARS style and quality of materials. And, like UGEARS models, the Wolf-01 is fully functional and produces real motion. UGEARS Wolf-01 is a mechanical wooden 3-d puzzle that consists of 62 pieces and comes with step-by-step detailed instructions. 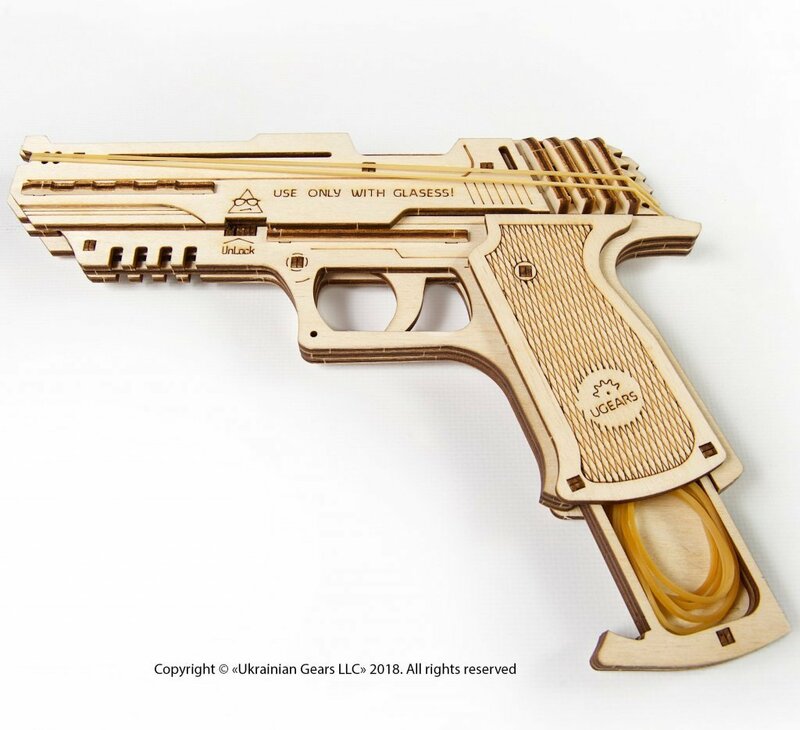 After the assembly is complete, you get a fully functioning handgun with a real 5-cap trigger revolver action, shooting a 60 X 1.5-millimeter caliber rubber bands. To “load” the Wolf-01 with “ammunition”, simply wrap rubber bands, one at a time, over the gun barrel, securing them at the special barbs on the gun striker. Now your Wolf-01 is fully loaded and ready for action! Release a trigger and watch your UGEARS Wolf-01 rubber ammunition shooting at a target as far as 32 feet away! Attach a laser pointer to the lower part of the gun and you get a perfect weapon to carry out a special operations mission! Arm your team with UGEARS Wolf-01 handguns and play a Warcraft and spy games, or organize a target shooting tournament. UGEARS 3-d puzzles are made with high-grade natural wood materials and are assembled without the use of glue or any other additional tools. You can order your own UGEARS mechanical Wolf-01 handgun on our website now! UGEARS Flexi-Cubus – a great stress reliever! How Additions makes playing with UGEARS Trucks more exciting?